There are few things Lake County looks forward to more than a 3-day weekend. And with this 3-day weekend past nigh, Lake County has three uninterrupted days to lose sleep over where & when the the next random monster tornado strikes. Haha, at least that's what your LakeCountyEye has made plans for, this weekend. So you don't have to. 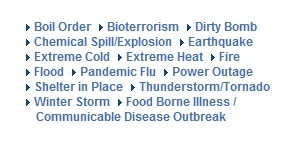 It is advisable to resist the immediate temptation to click on Bioterrorism or Dirty Bomb. While these nodoubt are emergencies of some vital importance, it is more often than not a good idea to prioritize your armageddons -- and first review, instead, your best emergency response to a tornado. Hopefully random monster tornadoes travel west to east. And that this one is over Lake Michigan by now.